Label all cartons with their basic contents and designated room. Seal each carton securely with packing tape and make sure items are well padded. Pack lamp shades in separate cartons. Wrap dishes separately. Nest cups and bowls with paper separating them. Secure movable parts, drawers, and racks on appliances. Defrost the refrigerator / freezer (start two days before moving). 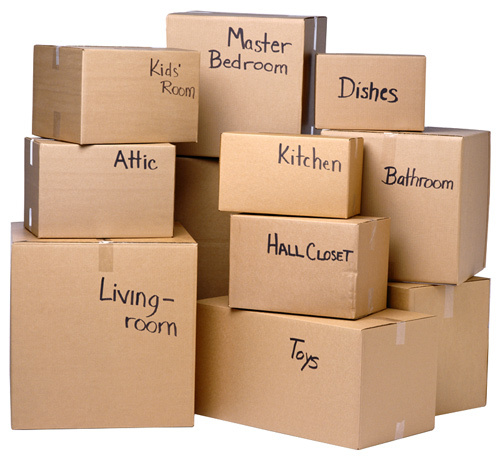 Pack heavy things in small sturdy boxes. Do not use newspaper to wrap fine china or lamp shades — the ink can smudge your items. Use specially designed containers for packing mirrors or framed pictures. NEVER move flammables, aerosol cans, caustic materials, or explosives! Take a full inventory of items you will be moving. Have a garage or rummage sale to get rid of unwanted items. Notify the following of your new address 1 month before you move: Post Office, Magazines, Banks, Insurance Companies, Charge Accounts, Employers. Prepare a family survival kit: Prescriptions, flashlight, paper plates & plastic serving ware, paper towels, important phone numbers, towels, soap, first aid kit, alarm clock, can opener, maps, etc. Arrange cut-off dates for utilities and phone. Obtain a sufficient supply of prescriptions to last through the move. Don't forget about the attic or other "forgotten" storage spaces! Keep a record of your moving expenses. Have your children pack a "survival kit" of toys for the trip ahead. Make sure your Big Brother Moving representative knows where to contact you during the move . Make moving a game for young children. Hang up a map of your new city or a photo of your new house. Plan a special activity immediately after the move. Plan a farewell party for the kids and their friends. Encourage exchanging phone numbers or email addresses so they can stay in touch with their friends. Check your new community's animal licensing requirements. Have vet records forwarded or take them with you. Remember pet food and water for the moving trip!